Our galaxy is filled with massive planets known as super-Earths. But what these planets are like has been anyone's guess. Now, for the first time, astronomers have determined that a super-Earth 42 light years away is incredibly cloudy – and that could affect our search for life on these potentially habitable worlds. Super-Earths are exoplanets that are between Earth and Neptune in size. What makes these planets so interesting — aside from the fact that they are really common in the Milky Way — is that we have no idea what they're like. Based on observations in our own solar system, we can guess what Earth-sized or Jupiter-sized exoplanets are like. But there is no analogue for super-Earths in our solar system. Are these planets rocky like Earth or gaseous like Jupiter? Are they water worlds? Are their atmospheres similar to Earth's, or are they thick, deep and filled with heavy molecules? Knowing these things will not only help us better understand how planets and solar systems form, but they will also help narrow down where we can reasonably look for otherworldly life in the galaxy. When GJ 1214b was first discovered in 2009, just 42 light-years from Earth, astronomers couldn't decide exactly what it was—either a mini-Neptune, with an extended, gassy atmosphere, or a planet made largely of water, with a more compact atmosphere rich in water vapor. Astronomers tried to figure out which it was by watching as the planet passed in front of its star. Water vapor is opaque to certain colors of light (water vapor is a greenhouse gas on Earth, for example, because it blocks infrared light from escaping into space). So a water-vapor-rich atmosphere should make the planet seem physically bigger through some colored filters, as the vapor blocks starlight. That's not what they saw. There was absolutely no apparent size change no matter which filters the astronomers used, but that could have meant one of two very different things. Either the planet indeed appeared slightly larger through different filters, but the change was too small to be picked up by the observations, or the planet's atmosphere was shrouded in high-altitude clouds, which prevented the astronomers from seeing the water-vapor effect at all. "Astronomers threw the kitchen sink at this planet for three years after its discovery," says Laura Kreidberg, of the University of Chicago, lead author on the GJ 1214b paper, "but the nature of the atmosphere has remained an enigma." No more. The new Hubble observations were so precise that they could have seen even a tiny change in the planet's apparent size. But even with so exceedingly sharp an eye using multiple filters trained on GJ 1214b, the planet remained just a single apparent size. That means that GJ 1214b is definitely shrouded with clouds—made not of water vapor, but rather of potassium chloride, or perhaps zinc sulfide. While it's awesome that we now know that GJ 1214b — and possibly other super-Earths — is covered in clouds, there is a downside: The clouds obscure what lies beneath. To detect life, astronomers will likely have to focus on trying to find "biosignatures" such as oxygen, but the seemingly perpetual high atmospheric clouds of GJ 1214b could shroud oxygen and other lower atmospheric gases. 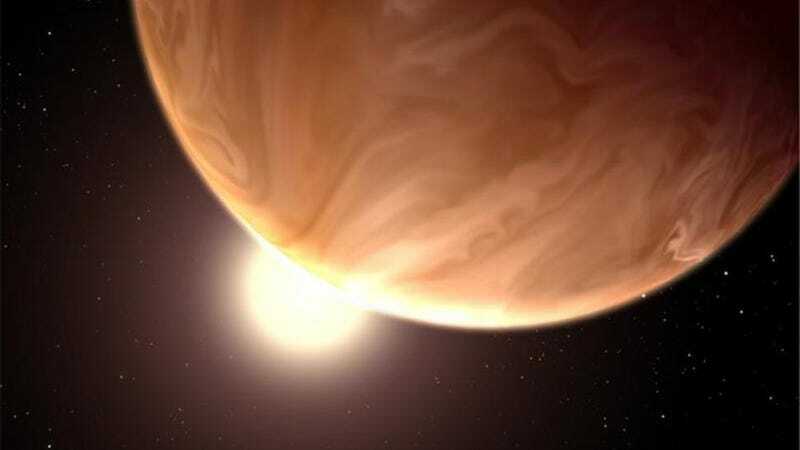 So if alien life does exist on GJ 1214b and other cloudy super-Earths, it may be difficult to find, thanks to the cloud cover, according to Lemonick. Read more over at Time, or check out the study in Nature. Image via NASA, ESA, & G. Bacon/STScI, STScI-PRC14-06.